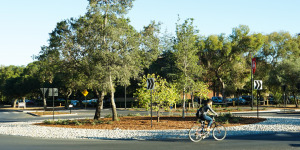 Over the summer, the University installed the first campus traffic circle at the intersection of Campus Drive and Escondido Road, cited one of the busiest intersections at Stanford. After three years studying Campus Drive’s traffic patterns, the University installed the first vehicle roundabout on Stanford’s campus at the intersection of Escondido Road and Campus Drive. Land, Building & Real Estate (LBRE) campus planners cited statistically proven safety and traffic benefits as the reason for installing the roundabout, according to Cathy Blake, associate director of Campus Planning and Design. They consulted Michael Wallwork, a leading expert in roundabout design, to work with Stanford traffic engineers to study the Escondido Road/Campus Drive intersection. University representatives also visited other cities and campuses with roundabouts to learn about their functionality. The particular intersection was chosen since it is one of the busiest on campus. Thus far, reception of the roundabout has been mixed, but LBRE expected that people would need time to become comfortable with the feature. Parking & Transportation Services (P&TS) has a webpage dedicated to answering questions about how to use the roundabout. The biggest change for bikers is that they are supposed to share the single lane of the roundabout with vehicles. The intersection’s speed limit is intended to slow down to “bike speed,” which is meant to make the roundabout safer than a traditional intersection. A bike circle was also installed this summer at the intersection of Lasuen Mall and Serra Mall in anticipation of increased traffic with the opening of Lathrop Library and new classrooms in the Lathrop building. According to Blake, the circle serves as a temporary experiment, and LBRE intends to gather input from cyclists about how helpful the roundabout is in guiding the flow of traffic before deciding to install a permanent one. Contact Sarah Moore at smoore6 ‘at’ stanford.edu.